Making a statement, tax day 2011. Photo by Ed Hedemann. For the first time in decades I find myself in danger of not owing federal income tax. As a resister/protester, this is unacceptable! I am self-employed, so I usually do a rough run-through on my taxes before the January 15 deadline for sending in last quarter estimated taxes. As a war tax resister I have chosen to file and openly refuse to pay the federal income tax portion. By the time I was working in the peace movement and learned about war tax resistance I was already in the system, and I liked the protest angle of openly refusing to pay so I just continued filing. For some years Social Security/Medicare (“self-employment tax”) were withheld from my paycheck, and when I went freelance I continued to pay those and state and local taxes. I’m pretty comfortable with my choices, recognizing some of the compromises and knowing that others within the war tax resistance network make other choices. NWTRCC ran a discussion of “to pay or not to pay” Social Security taxes a few years ago. Because I pay estimated taxes for self-employment (I make the check out to the Social Security Administration even though the IRS throws them in the big pot), I want to make sure that I don’t send in too much and inadvertently pay some of the income tax. I choose to resist 100% of whatever the IRS thinks I owe toward federal income tax and have worked up something of a debt with the IRS over the years, so they would keep anything I might overpay. I do pay my income taxes though, just not to the IRS. 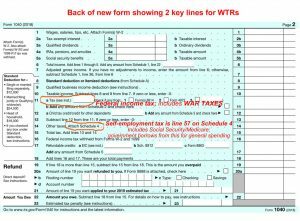 With my test calculations, I have now met the new streamlined IRS 1040 form — and the multiple schedules that go with it. 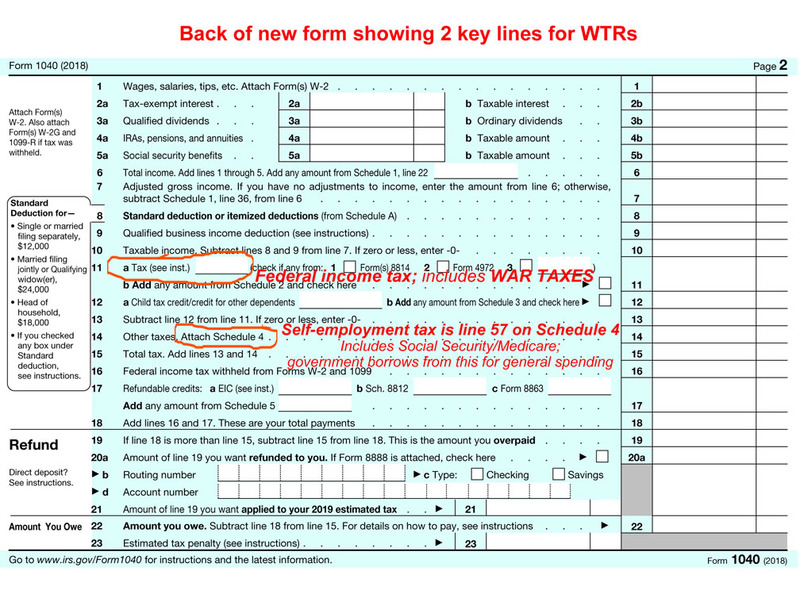 The “simplified” 1040 form really just moved many lines to new forms. As a self-employed person with a home office, I’ve always had to add Schedule C, SE, and 8829. Now I have to add Schedules 1, 4 (line 57 is the self-employment tax) and 5. My taxes are not really that complicated, so you might also have to add Schedules 2 and 3 and perhaps some other forms. Some of these new schedules are just a few lines on a whole sheet of paper. Of course, the feds really want us all to file electronically, but I’m sticking with paper and generally advise others who file to at least gum up the system — if not resist — and file on paper too. But now I have a problem! Mid-way through 2018 I quit one of my jobs and my income took a sizeable dip. That wouldn’t have been a problem tax-wise, except in combination with the new tax cuts I now find myself not owing any federal income tax for 2018 — a dilemma for those of us who actually like the protest of refusing to pay. I might have to juggle numbers on the Schedule C, take fewer deductions, and see how the numbers are looking. Doing that increases the amount I owe for Social Security, so I might decide to resist some self-employment taxes for the first time. I’ve been thinking about that anyway, because I’m pretty sure when I do start collecting Social Security I can expect a levy on the payments. If you are a nonfiler who read this far, you are probably saying “why bother!” I admire you for keeping out of the system, avoiding the minutia of U.S. tax law — and saving paper too! For other filers, how are the tax cuts hitting you? And how do you like the streamlined 1040? Yes, an interesting dilemma for those of us who are not content with just refusing to pay war taxes but also want to openly RESIST war taxes in order to put additional pressure on the machinery of war. I never want to be in a position of not owing taxes, even if that means resorting to claiming enough extra income so that I’ll show a tax due that I then can refuse to pay. If the IRS ever got wind of this, I wonder whether they’d dare prosecute someone who altered their tax forms to claim more taxes than actually owed and, of course, didn’t pay them? As to the new forms, this brings to mind Russell Baker’s “A Taxpayer’s Prayer,” which was quoted in yesterday’s NY Times obit of him: “O mighty Internal Revenue, who turneth the labor of man to ashes, we thank thee for the multitude of thy forms which thou has set before us and for the infinite confusion of thy commandments which multiplieth the fortunes of the lawyer and accountant alike….” If Baker were still alive, he would have no need to update the “prayer” (aside for broadening the scope of laborers). The idea of converting to a Roth IRA and then not paying is a fascinating one. In the real all days resistors would sometimes claim a war tax deduction to eliminate a tax debt. We occasionally heard of someone getting a refund based on that deduction! My dilemma for 2018 taxes is that I withdrew funds from accounts that had mandatory withholding. But my deductions for charitable giving were so large that I will supposedly get most of that money refunded. But I expect the IRS to capture that refund and apply it to past due resistance! Thank you Ruth, Ed, David and Larry for this discussion!